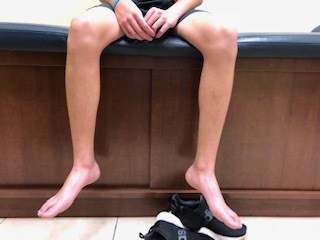 Must examine the lower leg to rule out external tibial torsion (external position of the lower leg on the upper leg bone) or other associated causes of out toe. Long-term this condition may be associated with hip problems including arthritis. In a young teenager with hip pain slipped hip growth plates (slipped capital femoral epiphysis) must be ruled out. Not usually due to in utero position as the fetus’ tibia is usually rotated internal. Child may lack coordination during activity. With the knee flexed at 90 degrees the lower leg bone (tibia) is rotated in and out relative to the upper leg bone (femur). If the deformity is significant x-rays may be taken. 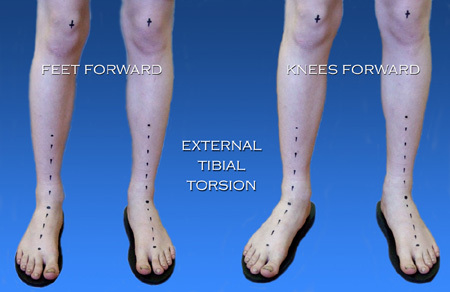 The lower leg bone (transmalleolar axis) is measured relative to the upper leg bone (bicondylar axis of proximal tibia). In an adult it is approximately 14 degrees external. If the foot is flat orthotics are necessary for the foot to prevent the creation of or worsening of a flatfoot deformity. It will also help to bring the foot slightly up and in, lessening some of the appearance of the deformity. If associated with excessively tight ligaments and tendons around the knee a short course of immobilization in a cast above the knee may be of some benefit. When a cast is applied the lower leg bone (tibia) is gently rotated internally relative to the upper leg bone (femur). This causes a gentle stretch on the ligament and tendon structures around the knee area. Cast may be necessary for up to 8 weeks depending on the degree of problem. 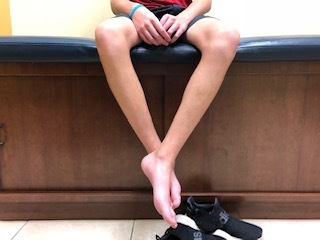 Flatfeet in children is a common cause of out toe gait, although not readily appreciated by the general medical community. 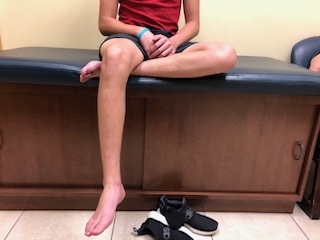 When the foot points to the outside (out toe) in hips examination (again, femoral anteversion) and leg examination (external tibial torsion) has been ruled out then the primary cause of an out toe gait on a child is a flatfoot deformity. Some of these deformities occur at the same time. With instability to the medial arch area the foot flattens and rotates to the outside. In addition, the arch may appear to be relatively normal but the front part of the foot is positioned excessively to the outside, relative to the back part of the foot. Trauma to tendons and ligaments on the inside of the arch and ankle may cause the arch to slowly or acutely drop. Leg cramps and pain at times during the night. Very common in children. Back pain is commonly associated with it. Feet and ankles look abnormal. Bulging of the bone on the inside of ankle and foot. Surgery if all efforts at conservative care have failed to alleviate a person’s problem. Failure to consider a surgical alternative may condemn a child or adult with severe deformity to a future of pain, suffering and poor health. 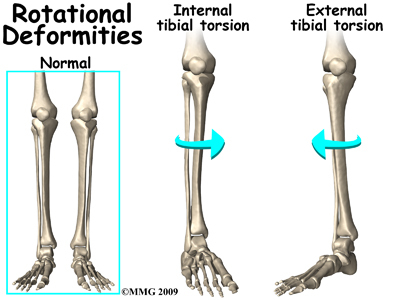 The illustration below depicts the relationship between the femur (thigh bone) and tibia (the larger of the two leg bones) at the level of the knee joint where any abnormal internal or external rotation will cause torsion of the tibia leading to compensation at the ankle and foot with activities.